BACKGROUND AND PURPOSE: Previous reports have suggested that second branchial cleft cysts (BCCs) appear on sonograms as well-defined, cystic masses with thin walls and posterior enhancement. Previous CT and MR imaging findings, however, have indicated heterogeneity of these masses, and, in our experience, sonography also shows a similar variable appearance. In this communication, we report the cases of 17 patients with second BCCs and document the variability of sonographic patterns. METHODS: The sonograms of 17 adults with second BCCs were reviewed. Only patients with surgical or cytologic evidence of BCCs were included in this study. The features evaluated were the location, internal echogenicity, posterior enhancement, and presence of septa and fistulous tract. RESULTS: Four patterns of second BCCs were identified: anechoic (41%), homogeneously hypoechoic with internal debris (23.5%), pseudosolid (12%), and heterogeneous (23.5%). The majority (70%) showed posterior enhancement. All were situated in their classical location, posterior to the submandibular gland, superficial to the carotid artery and internal jugular vein, and closely related to the medial and anterior margin of the sternomastoid muscle. Fourteen (82%) of the 17 BCCs had imperceptible walls, and all were well defined. For none of the patients was a fistulous tract revealed by sonography; the presence of internal septations was revealed for three patients. CONCLUSION: As previously suggested by CT and MR imaging findings, sonography reinforces that second BCCs in adults are not simple cysts but have a complex sonographic pattern ranging from a typical anechoic to a pseudosolid appearance. Second branchial cleft cysts (BCCs) present clinically as a soft-tissue swelling in the anterior neck. Imaging is invariably necessary, because in diagnosing second BCCs, clinical examination is reliable for identifying only 50% to 60% of cases (1−3). Although the roles of CT and MR imaging are well documented (4−6), the superficial nature of the lesions also makes them accessible to sonographic evaluation. The role of sonography in the examination of superficial structures is well-established (7−12); it is easily available, inexpensive, and readily combined with fine needle aspiration cytology. In the past, sonography was used predominantly to differentiate a solid from a cystic mass. With modern high-resolution transducers, however, one can now evaluate the internal architecture of the lesion. Using sonography, second BCCs have been shown to be well defined, smoothly outlined, and uniformly anechoic with posterior enhancement (13, 14). Nevertheless, in our experience, this is not the case. Second BCCs in adults have variable sonographic appearances, which may confuse the inexperienced. We therefore herein document the range of sonographic appearances of second BCCs in adults and discuss differential diagnoses. The sonograms of 17 patients with second BCCs were retrospectively reviewed. One sonographer performed all of the imaging. The scans were reviewed by two radiologists with 8 and 3 years' experience, respectively, in head and neck sonography, and the results were obtained by consensus. Only those patients with surgical or cytologic evidence of BCCs were included in this study. None of the patients had any clinical evidence of infection at the time of the examination or during the recent past. Two patients had undergone previous surgery for second BCCs and were presenting with recurrent BCCs. In these two patients, the presence of scar tissue from the previous surgery did not cause any difficulty in imaging. There were 10 female and seven male patients, with ages ranging from 18 to 62 years. The patients underwent imaging in the supine position, and their necks were hyperextended on a pillow. All imaging was performed with a 7.5- or 10-MHz transducer, and the images were obtained in the transverse and longitudinal planes. In all cases, the salivary glands were carefully imaged to rule out the possibility of an exophytic/pedunculated cyst arising from the salivary glands. The sonograms were evaluated for the following features: site of the mass, size, walls, margins, loculation, internal echogenicity, posterior enhancement, internal septa, and fistulous communication. The site was characterized in relation to the submandibular gland, carotid artery, internal jugular vein, and sternomastoid muscle. Internal echogenicity was characterized as anechoic (strictly no internal echoes), homogeneously hypoechoic (lower amplitude than surrounding tissues, predominantly cystic with low amplitude internal echoes), homogeneously hyperechoic or pseudosolid (more echogenic than adjacent tissues), and heterogeneous. Wall thickness was defined as imperceptible, thin (1−2 mm), or thick (>2 mm). All of the cysts were evaluated for the presence of a “beak” or tapering edges of the cyst (particularly in relation to the carotid bifurcation) because these may indicate the presence of a fistula on sonograms. None of the patients in this series had a cutaneous opening, and hence the presence of a superficial sinus tract could not be evaluated. All of the BCCs in this study were centered on the angle of the mandible, posterior to the submandibular gland, superficial to the carotid artery and internal jugular vein, and closely related to the medial and anterior margin of the sternomastoid muscle. BCCs ranged in size from 17 to 53 mm in maximum transverse diameter. Of the 17 lesions, one (6%) had thin walls, two (12%) were thick-walled, and 14 (82%) were imperceptible. All 17 lesions had well-defined margins. Fourteen (82%) of the cysts were unilocular, and three (18%) were multiloculated with the presence of septations within a single cyst. Four patterns of BCCs were identified. Seven (41%) of the lesions were truly anechoic (Fig 1A). Four (23.5%) were predominantly homogeneously hypoechoic but showed the presence of internal, low-amplitude, freely floating debris (Fig 1B). Two (12%) were hyperechoic and showed a pseudosolid appearance (Fig 1C). On real-time images, after the application of transducer pressure on the cyst, the entire contents shifted in all cases, suggesting their true cystic nature. Four (23.5%) showed heterogeneous internal echoes with internal debris and septa (Fig 1D). A, Longitudinal sonogram of an anechoic second BCC (calipers) with posterior enhancement. B, Longitudinal sonogram of a second BCC (open arrows), predominantly hypoechoic with faint internal debris. Note the presence of posterior enhancement. C, Transverse sonogram of a second BCC (straight arrows) with homogeneous, hyperechoic, internal echoes (pseudosolid). Note the lack of posterior enhancement. Curved arrows identify the bifurcation of the carotid artery. Note that no portion of the cyst extends into carotid bifurcation. D, Transverse sonogram of a second BCC (large arrows) with heterogeneous internal echoes, debris, and septa (small arrows). Note the lack of posterior enhancement. Curved arrows identify the bifurcation of the carotid artery. Note that no portion of the cyst extends into carotid bifurcation. E, Transverse sonogram of a second BCC (straight arrows) with thick walls (arrowheads) and internal echoes. Note the lack of posterior enhancement. Curved arrow identifies the common carotid artery. Twelve (70%) lesions showed posterior enhancement. None of the four lesions with heterogeneous internal echoes, debris, and septa exhibited posterior enhancement. Of the two lesions with a pseudosolid appearance, only one showed posterior enhancement. For none of the patients was a fistulous or sinus tract identified by sonography. In three cases, the diagnosis was confirmed at surgery. Of these, one patient underwent surgery for a recurrent branchial cyst, which showed heterogeneous internal echoes and septation. The remaining two patients had not undergone previous surgery. One of these showed a pseudosolid pattern and the other a mixed pattern with internal debris and septation. Histologic analysis revealed cysts lined with squamous epithelium, with abundant lymphoid tissue and follicles beneath the epithelium. Adjacent small adherent nodes were seen in one specimen. None showed any evidence of malignancy. There was no obvious correlation with the sonographic findings. In the remaining 14, there was cytologic evidence of BCCs, which showed variable amounts of lymphocytes, debris, and benign squamous epithelium. Previous reports have shown a good correlation between cytologic diagnosis and histopathologic examination when the above cytologic features are shown (15). Both patients with recurrent second BCCs had similar sonographic appearances. They had mixed internal echogenicity with thick walls and septa and did not show posterior enhancement (Fig 1E). Most branchial anomalies arise from the second branchial apparatus. A number of theories exist to explain the development of abnormalities within the branchial cleft (16). The most widely held belief is that incomplete obliteration of the cervical sinus plays an important role in this process (17). If no communication occurs with inner mucosa or outer neck skin, trapped arch remnants form a cyst. Sinus anomalies have, by definition, a communication with the external skin or pharyngeal mucosa and end as a blind tubule or saccule within mesenchymal tissue. The word fistula is applied to the anomaly when both external and internal openings are present. Most second BCCs are located in the submandibular space. Because of the anatomic relationship of the second branchial apparatus and the cervical sinus, however, they can occur anywhere along a line from the oropharyngeal tonsillar fossa to the supraclavicular region of the neck (17). Bailey (18) classified second BCCs into four types. The Bailey type I cyst is the most superficial and lies along the anterior surface of the sternomastoid muscle, just deep to the platysma muscle. The type II cyst is the most common and is found in the classic location for these cysts, which is along the anterior surface of the sternomastoid muscle, posterior to the submandibular gland. A type III cyst extends medially between the bifurcation of the internal and external carotid arteries to the lateral pharyngeal wall. The type IV cyst lies in the pharyngeal mucosal space and is lined by columnar epithelium. Second BCCs appear as painless fluctuant masses in the lateral portion of the neck adjacent to the anteromedial border of the sternomastoid muscle, at the angle of the mandible (19−21). The mass enlarges over time and may become painful or tender if secondarily infected (20). Patients with BCCs are usually older children or young adults in contrast to patients with fistulas who are usually infants or children (22, 23). Second BCCs are usually filled with a turbid yellowish fluid and may contain cholesterol crystals. Their walls are thin and lined by squamous stratified epithelium overlying lymphoid tissue (20, 21, 24). Columnar respiratory epithelium is occasionally present (14). The typical sonographic appearance of a second BCC has been described as an anechoic, well-circumscribed cyst (13, 14, 25). Some may show faint low-level internal echoes if infected (25). Others have suggested that the sonographic appearances may range from anechoic to highly echogenic (15). In our study, only seven lesions were truly anechoic, another four were predominantly anechoic but contained internal debris, four had a complex heterogeneous echo pattern, and two had a uniformly homogeneous pseudosolid appearance. The pseudosolid appearance of cystic lesions has been previously described (26) and arises from cellular material, cholesterol crystals, and keratin within the cyst. The uniform echogenicity may lead to an erroneous assumption that the lesion is solid, especially if posterior enhancement is absent. When pressure was applied to the cyst with the transducer, however, the entire contents shifted, suggesting its cystic nature. Three patients in this study had BCCs that showed a complex echo pattern because of coarse internal debris and septa. Intense posterior enhancement is a characteristic feature of an uncomplicated cyst. In this study, posterior enhancement was present in 70% of the cases and easily identified in lesions that were anechoic or predominantly hypoechoic with faint internal debris. Posterior enhancement was absent in five (30%) of the 17 cases. Four of these had heterogeneous internal echoes with debris and septa, and one had a pseudosolid appearance. In lesions that had a pseudosolid appearance, the appreciation of posterior enhancement was subtle and the shifting nature of the contents on applying transducer pressure was the key to identifying the cystic rather than solid nature of the nodule. All of the second BCCs in this study were well defined. One (6%) of the lesions had thin walls, two (12%) had thick walls, and the remaining 14 (82%) had imperceptible walls. Thick walls most likely arose from inflammation and cellular debris. The majority of cysts in this series (82%) were unilocular. The diagnosis of a second BCC is relatively easy when it is located in its classical position and sonographically appears as an anechoic mass or predominantly hypoechoic, cystic mass with faint internal debris and posterior enhancement. When it sonographically appears as a pseudosolid or heterogeneous mass with internal debris and septa, however, the differential diagnoses include noninflammatory lesions, such as malignant lymphadenopathy, lipoma, nerve sheath tumor, carotid body tumor, external laryngocoele, cystic hygroma, and inflammatory lesions such as tuberculous node, and abscess (17). In all cases presented herein, characteristic sonographic appearances helped to distinguish these from second branchial cysts. 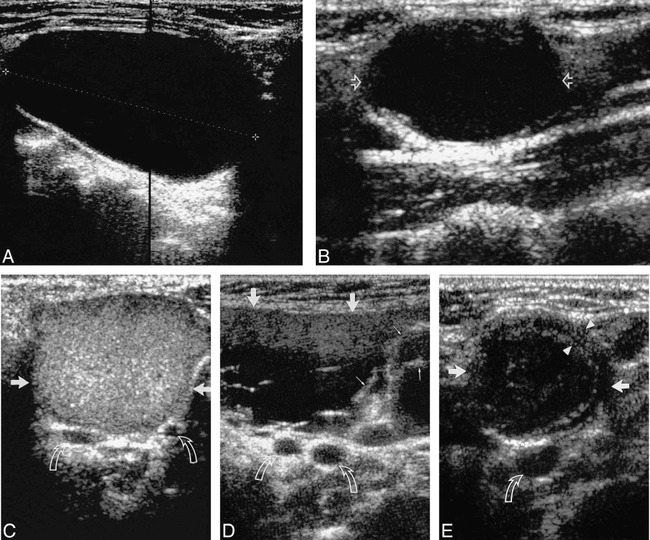 Lymphomatous nodes are usually round and hypoechoic with posterior enhancement (27) and show prominent capsular and hilar vessels on color Doppler sonograms. Metastatic nodes often show loss of hilar anatomy and are round and hypoechoic with predominant capsular flow on color Doppler sonograms. Enlarged reactive nodes at this site are hypoechoic and solid, show the presence of an echogenic hilus, and show hilar vascularity on color Doppler sonograms. Tuberculous nodes exhibit intranodal necrosis, matting, and adjacent soft-tissue edema (28). On sonograms, lipomas are elliptical masses parallel to the skin surface, are hyperechoic compared with adjacent muscle, and contain linear echogenic lines at right angles to the sonographic beam (29). Uninfected cystic hygromas are seen as multiple, compressible cysts of varying sizes, with thin walls and intervening septa that infiltrate between and around neurovascular structures. In infected or hemorrhagic lesions, the cyst walls are irregular, contain internal debris, are incompressible, and mimic a solid lesion. On sonograms, nerve sheath tumors show a hypoechoic, heterogeneous echo pattern (30) and may exhibit posterior enhancement (31, 32). The nerve immediately adjacent to the tumor may be thickened, producing a tapering edge to the oval tumor (30). Sonographically, a carotid body tumor is seen as a clearly defined, solid, noncalcified, and hypoechoic mass. Color Doppler sonography shows the encasement of the bifurcation or splaying by tumor particularly well. Internal (simple) laryngoceles are echo-free, well-defined structures inside the thyroid cartilage. External (mixed) laryngoceles have an additional cystic mass outside the laryngeal skeleton, which is connected through the thyrohyoid membrane to the intralaryngeal component. When infected, the echoes within the laryngocoeles are mixed and the walls may appear thickened (33). Although sonography readily confirms the diagnosis of a second BCC and differentiates it from other pathologic findings, it may be unable to delineate the entire lesion, particularly those that have a medial parapharyngeal component and recurrent lesions. In these cases, CT or MR imaging with contrast enhancement may be indicated to depict the deep extent, thus allowing for better preoperative planning. MR imaging is superior to CT because of its multiplanar capability and its better soft-tissue contrast (34). Although sonography does not seem to add any information to that which is already available by using CT or MR imaging, it does provide the surgeon adequate preoperative information. It confirms the diagnosis and defines the location of the BCC and its relationship to adjacent structures, particularly the carotid artery and its bifurcation. It may be unable to show the fistulous tract. To our knowledge, however, we are not aware of any reports demonstrating that CT or MR imaging can conclusively define this fistulous tract. This is not a major drawback because the surgeon will invariably explore the region for the presence of such a communication. The sonographic appearances of second BCCs in adults are variable, and to make a correct diagnosis, the sonographer must be familiar with these appearances. As previously suggested by CT and MR imaging findings, sonography reinforces that second BCCs in adults do not seem to be simple cysts but instead have a complex cystic pattern ranging from the anechoic to a pseudosolid appearance. ↵1 Address reprint requests to Anil T. Ahuja, FRCR, Department of Diagnostic Radiology & Organ Imaging, Prince of Wales Hospital, Shatin N.T., Hong Kong.